The History of Sam and his Famous Bagels! America's favorite bagel man, Chef Sam Abdalla began his culinary career in 1989. It didn't take long for his creative enthusiasm for reinventing traditional American dishes to make a splash in New Jersey and eventually all across the United States. Ultimately creating over 40 varieties of bagel flavors, but probably best known for his creation of the popular “French Toast” and “Waffle” bagels in 1998. Never satisfied, Chef Sam continued to expand his culinary experience in 2013 with his completion of the intense pastry training at the esteemed International Culinary Institute (formally The French Culinary Institute). While studying past masters, Chef Sam always had his eye on the future. In 2014, America's favorite bagel-man made his New York debut, as owner and head chef of "The Corner Café" on West 24th Street and the Avenue Of The Americas in Chelsea. Over the years, many have used modern technology and ingredients to make their bagels. Forgoing taste in order to save time and money. Not Chef Sam! "There are no shortcuts in making great bagels," according to Sam, "they must be hand-made using the finest ingredients, hand-rolled, boiled, and baked in order to achieve perfection!" If you can't tell by now, Chef Sam loves tradition, which is why he chose to be located at “The Corner” building constructed from 1886-1887. 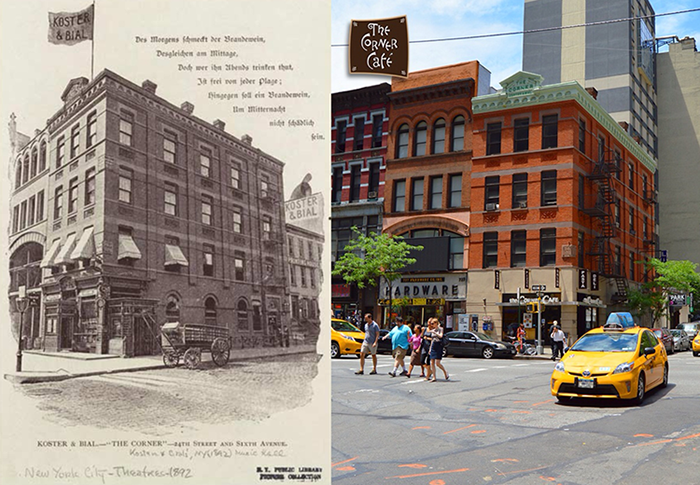 Just look below at a picture of the building from 1892, it looks remarkably the same today! Thomas Edison presented the first demonstration of a moving picture at "The Corner" in 1896. In 2014, Chef Sam is demonstrating what's old is new again at "The Corner Café." He declared: "I believe in preserving the past! I believe in homemade food! I believe in great service!" Even after 25 years, Chef Sam's creative enthusiasm has only grown and his commitment to reshaping our food experience with every bite remains unwavering. He says: "The magic that is New York and the café's historic setting has inspired me to bring America's traditional comfort foods back in a big way!" New York food fans rejoice! In a city that never sleeps, "The Corner Café" is a friendly place where folks can meet for breakfast, lunch or dinner. Enjoy the finest homemade bagels, pizza, soups, wraps, salads, sandwiches, pasta, muffins, cakes, cookies and so much more! Now, Sam has brought his Famous Bagels to New Jersey!